Light Duty Casters Weight Capacities Ranging from 175 lbs to 350 lbs - Sizes: 3" thru 5"
CasterHQ's TPR (Thermoplastic Rubber or TPE for Thermoplastic Elastomer) Wheel is specially engineered to provide unsurpassed durability and reliability. This premium wheel combines the durability of a hard tread wheel with the quiet floor protection of a soft tread wheel. They are made of a thermoplastic elastomer which is permanently bonded to a polypropylene core and will not mark floors. The Performance TPR Wheel is resistant to chemicals, acids, bases, alcohols, salts and steam. The Performance TPR Wheel tread material can be made to various durometers. •	Non-marking Thermoplastic rubber tread is permanently bonded to Polyolefin core. •	Shock absorbing cushioned ride offers floor protection and quiet rolling operation. •	Offers good stability at low temperatures. •	Resistant to cleaning chemicals, acids, alcohol, water, and is excellent for wash down applications & outdoor use, UV resistant. •	Flat tread wheels offer maximum durability at rated capacities; while round tread wheels offer an easy rolling ergonomic ride; reduced tread surface area also enables improved swiveling capabilities and turning mobility. •	Gray & black tread colors are available; both are non-marking. •	Durometer: 75 Shore A (+/-5). 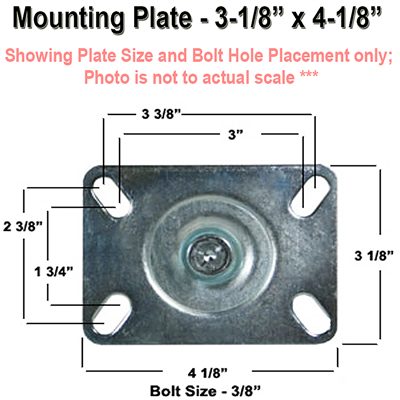 •	Temperature range: -40° F to 180° F.
PLATE SIZE: 3-1/8" X 4-1/8"
BOLT HOLE PATTERN: 1-3/4" X 2-15/16" TO 2-3/8" X 3-3/8"
This attractive wheel accommodates a large number of industries and a limitless number of applications. They are smooth and quiet, absorb shock and have superior impact resistance. These wheels resist flat spotting, acids and make equipment easier to handle. 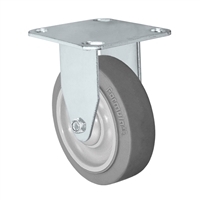 Performance Wheels are extremely resilient and easily rolls over debris and uneven surfaces. They are very popular in institutional, food service, retail display, hospitals, schools, restaurants and all types of industrial and manufacturing environments including factories, warehouses and shop floors. Performance wheels are available in both flat and round treads. 3" x 1-1/4" Rigid Caster | Thermo Plastic Rubber Wheel | 225 lbs Capacity | Plate Size: 3-1/8" x 4-1/8"
3" x 1-1/4" Swivel Caster | Thermo Plastic Rubber Wheel | 225 lbs Capacity | Plate Size: 3-1/8" x 4-1/8"
3-1/2" x 1-1/4" Rigid Caster | Thermo Plastic Rubber Wheel | 230 lbs Capacity | Plate Size: 3-1/8" x 4-1/8"
3-1/2" x 1-1/4" Swivel Caster | Thermo Plastic Rubber Wheel | 230 lbs Capacity | Plate Size: 3-1/8" x 4-1/8"
4" x 1-1/4" Rigid Caster | Thermo Plastic Rubber Wheel | 300 lbs Capacity | Plate Size: 3-1/8" x 4-1/8"
4" x 1-1/4" Swivel Caster | Thermo Plastic Rubber Wheel | 300 lbs Capacity | Plate Size: 3-1/8" x 4-1/8"
5" x 1-1/4" Rigid Caster | Thermo Plastic Rubber Wheel | 315 lbs Capacity | Plate Size: 3-1/8" x 4-1/8"
5" x 1-1/4" Swivel Caster | Thermo Plastic Rubber Wheel | 315 lbs Capacity | Plate Size: 3-1/8" x 4-1/8"